Once there was a little boy who grew up in a little town and worked in his fathers home based business. As it was for centuries, it was the custom of the day for the father to teach his trade to his son when he turned 12 years of age. For many years, this young man worked side by side with his father as his father taught him all he knew. Then at a certain point, this young man left the family business to go out on his own. Though his family didn't fully understand him; he had learned all he could from his earthly father and now he needed to follow his Heavenly Father. As you may know by now, this young man was Jesus of Nazareth. At the age of 30, he would begin to reveal to the world who he really was. 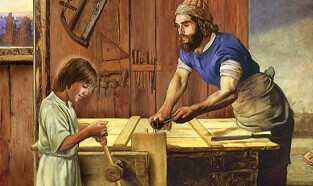 He was more than a carpenter! He was God in the flesh. In Matthew 3:13-17, Jesus goes public. There's a time to go public - v13 baptism is a public declaration. Jesus went public and God was pleased. God will be pleased as we go public for Him. Baptism is the first step to show others your faith in Christ. Testimony is living the difference (II Cor.5:17). Witnessing is natural as we understand what God has done for us. (Rom. 1:16). It will require humility… 14 John forbade him…he felt unworthy. Are you willing to go public with Jesus, today?